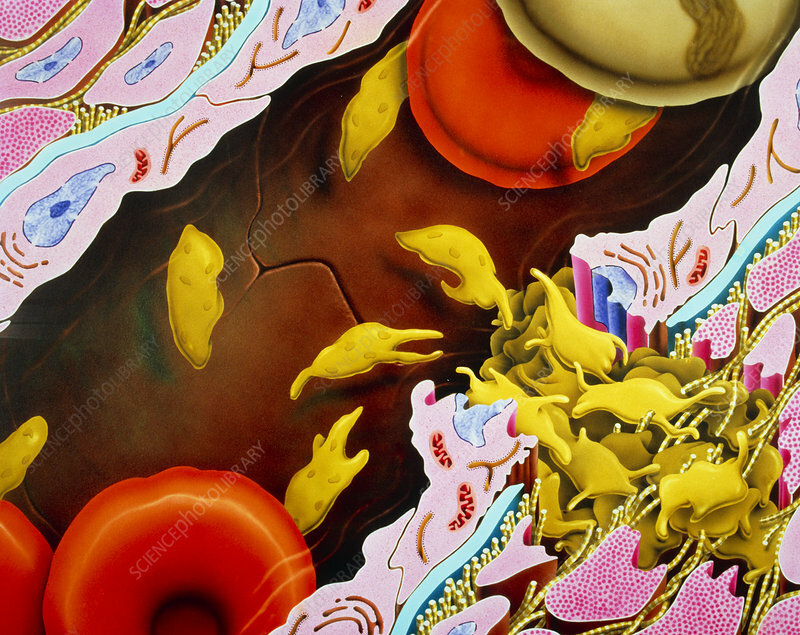 Artwork featuring the role of blood platelets in the repair of a damaged blood capillary. Here, platelets have formed a plug through the damaged epithelium & into the underlying cells. Red cells (erythrocytes) and a single white cell (at top) are also visible inside the capillary. The endothelial lining of a blood capillary consists of a single row of elongated cells. The presence of a relatively large nucleus causes the endothelial cell to bulge slightly into the lumen (interior) of the capillary. Here, the endothelium has ruptured down the middle of one of its cells. This image is third in a series of four.